Inefficient factory blow off valves (BOV) can hinder boost response during shifts and can damage your expensive turbo charger. PERRIN offers several choices for owners to choose the best solution to the problem. 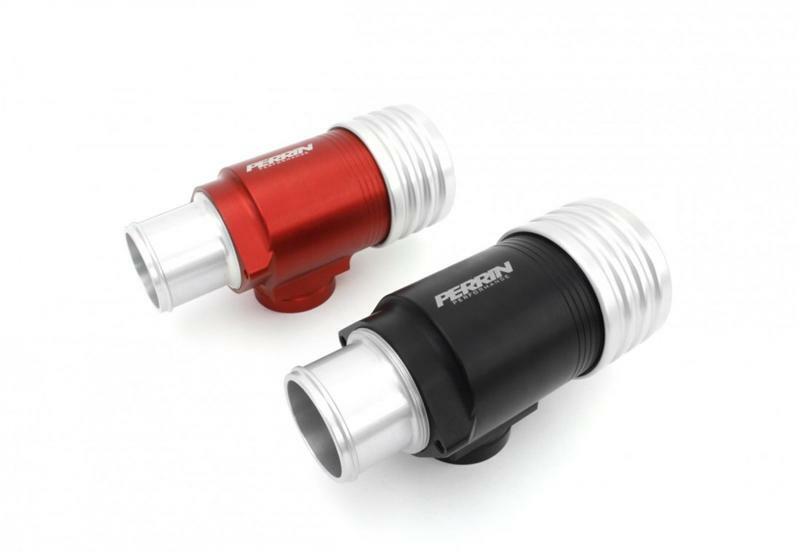 The PERRIN blow off valve cap, piston & flange are all CNC machined from 6061 Billet Aluminum. The body is CNC machined from a single block of aluminum. No additional bolt on pieces means we eliminate potential leaks. The PERRIN BOV features an adjustable cap which allows you to tailor when your BOV releases. Set it up loose for a smoother release of boost at light loads and RPM. Or crank down the cap to release boost only at higher boost loads and RPMs. This feature is independent of relief volume. Our unique design allows you to adjust the volume of air released when blowing off. This adjustment is independent of the resistance to blowing off. Venting too little can damage the turbo, venting too much air can will make the throttle less responsive. The PERRIN blow off valve requires very little maintenance but when needed, it’s very easy and quick to disassemble the blow of valve with no special tools required.